Reporters Without Borders hails the Iraqi interior ministry’s creation of a hotline for journalists in danger just a few weeks after it set up a special police unit to investigate murders of journalists. Created jointly with the Journalistic Freedoms Observatory in Iraq (JFO), a Reporters Without Borders partner organisation, the hotline may have already saved lives. Two journalists in the southern city of Basra eluded threats by calling the number and getting the security forces to intervene. The war in Iraq has been the deadliest armed conflict for the media since the Second World War, with at least 222 journalists and media assistants killed since the start of the US-led invasion in March 2003. 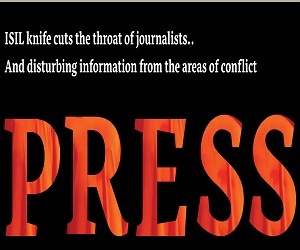 Reporters Without Borders urged the Iraqi authorities in May 2007 to create a Task Force for crimes of violence against journalists along the lines of a special force set up for this purpose in the Philippines. In the course of several meetings with Iraqi President Jalal Talabani, the press freedom organisation has repeatedly called for measures to combat impunity. According to the Iraqi interior ministry, some 50 police investigations are currently under way into murders, kidnappings and physical attacks in which journalists were the victims. The police have meanwhile announced the arrest of a suspected Al-Qaeda member of Saudi nationality who is believed to have participated in the murder of four employees of the privately-owned Al-Sharqiya TV station on 13 September in the northern city of Mosul. The police are still looking for his accomplices. By calling the hotline, which is manned by the JFO, Al-Hurra TV correspondent Saad Qusay, obtained around-the-clock police protection at his home in Basra after being threatened by an armed group, one of whose members was identified and arrested. The authorities subsequently advised him to leave the country temporarily as an additional safety measure. After intruders broke into the Basra home of Al-Sumariya TV correspondent Hashem Al-Ibi and threatened him in connection with his journalistic activities, he called the hotline and the police succeeded in identifying and arresting them. As well as the hotline, the partnership between the interior ministry and JFO also envisages measures to facilitate journalists’ movements about the country, including the loan of helmets and bullet-proof vests to journalists visiting war zones. With support from American Express, Reporters Without Borders has been operating a “Press SOS” hotline in France for the past 15 years. The number can be called 24 hours a day in French or English, reversing the charges if necessary, in order to report the arrest, deportation or disappearance of a journalist to Reporters Without Borders. Not only journalists but also their families, news media and journalistic organisations are invited to use the hotline. 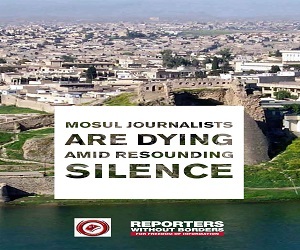 The Journalistic Freedoms Observatory in Iraq won the Reporters Without Borders-Fondation de France annual prize in the Press Freedom Defender category in 2007 for its vital work in gathering and reporting information about violence against journalists in Iraq. 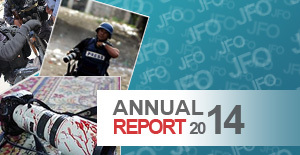 The same year, JFO joined the Reporters Without Borders network.